Luckily, I was able to track down some tickets from someone who couldn’t go anymore. I was super excited! I didn’t tell A about it until we got to Disneyland on the day of the party. The expression on her face and her excitement was worth it! So for those that don’t know, Mickey’s Halloween Party is a special ticketed event at Disneyland during the Fall (mid Sept- Oct), where Disneyland is closed to the public in the evening for 5 hours on select evenings. 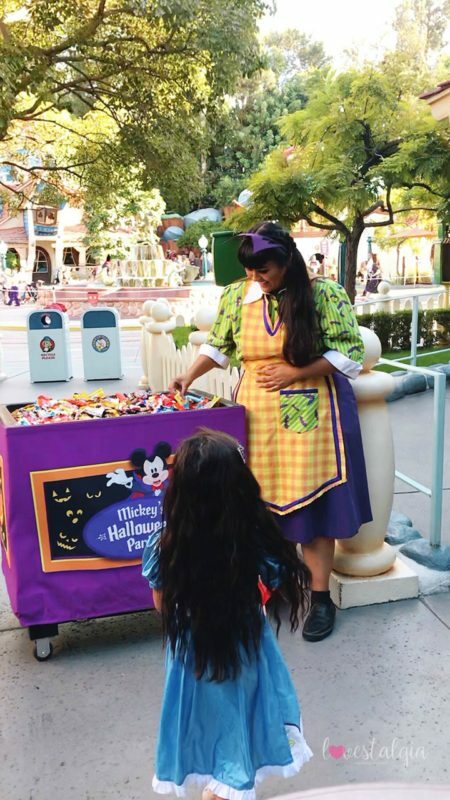 Guests with tickets can participate in the special trick-or-treating, parade, fireworks, special character meet and greets and enjoy the festivities of the Halloween season during that time. Guests can also come 3 hours before the party time to enjoy both Disney California Adventure and Disneyland. 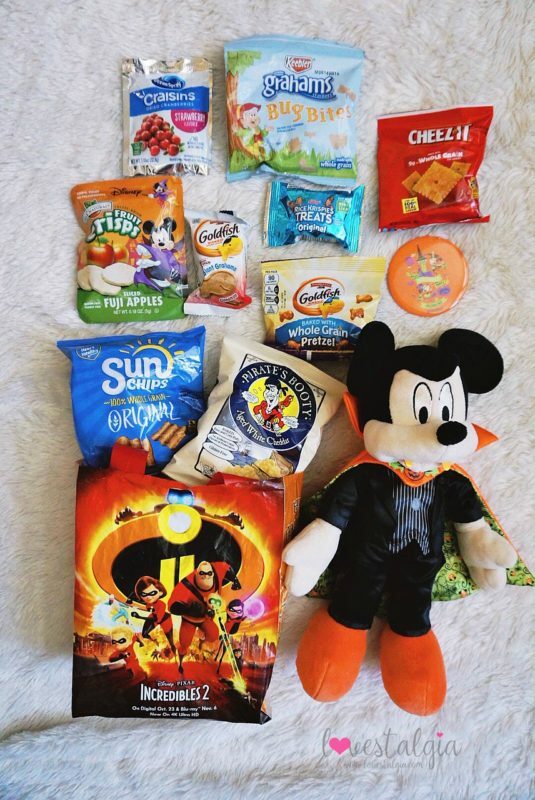 You can find out more about Mickey’s Halloween Party here. The Magic Kingdom Mamas do a very thorough job of going over the party in this blog post. 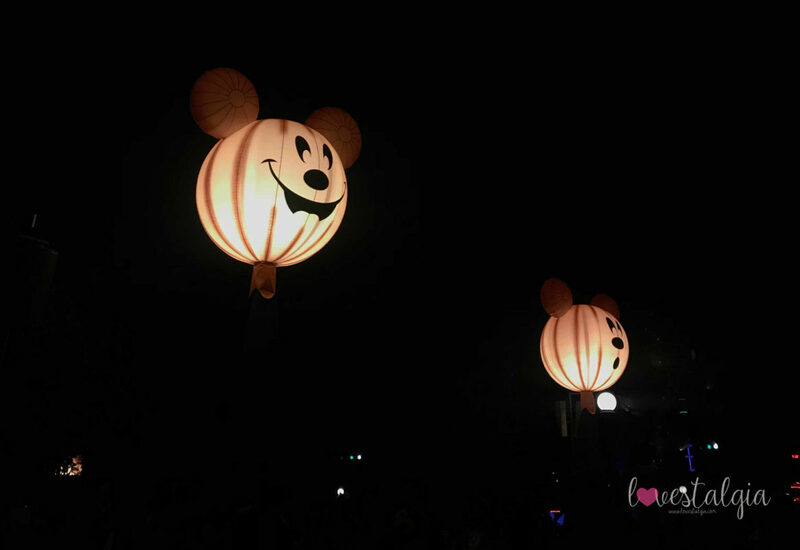 Mickey’s Halloween Party is different from Mickey’s Not-So-Scary Halloween Party which happens at Walt Disney World in Florida. Paying $95-$130 per person for 5 hours of party time at Mickey’s Halloween Party sounds steep. I totally get it. Especially if you’re already paying money for your annual pass. 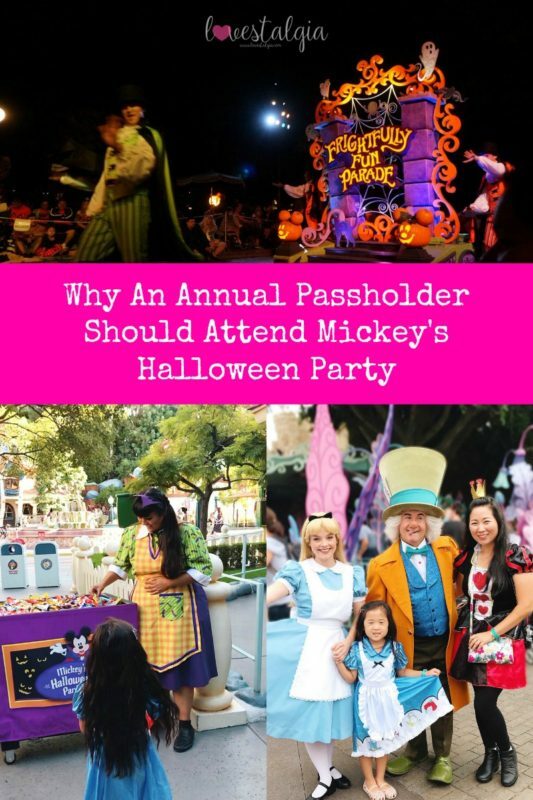 So what makes the party worth it for an annual passholder? Do you think you should get tickets next year? Short answer- YES. But I also know that it’s not affordable for a lot of people. When it comes down to it, you want value for your money. So is it valuable for one night at Mickey’s Halloween Party as an AP? First of all, you have to decide what you want out of the party. If you want all the candy and treats, then focus on that. If you want to meet all the special characters, then look on the schedule and find them. I know there are many people who come to Mickey’s Halloween Party are not usually annual passholders so they take advantage of the rides. 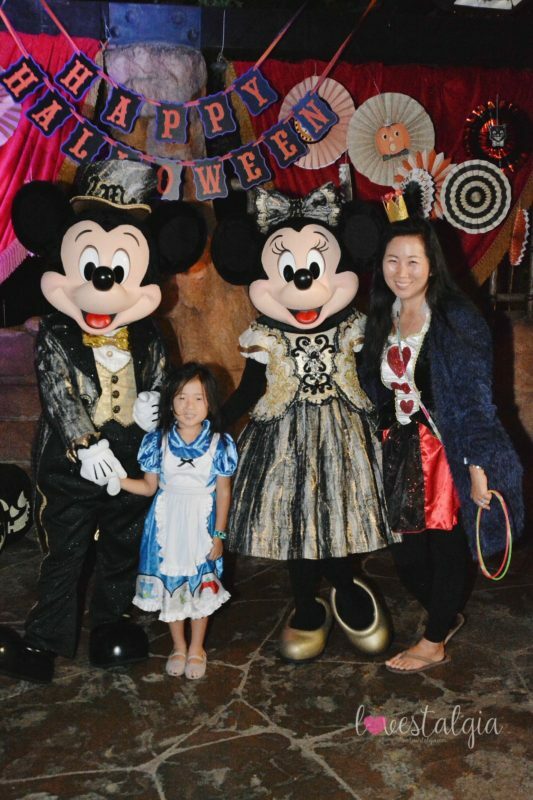 So why was it worth it to me as an AP to go to Mickey’s Halloween Party this year? Since we already have APs, we didn’t have to worry about getting on rides. We focused on other things like candy, optimal parade viewing, fireworks and character meet and greets. We really just wanted to experience the party. 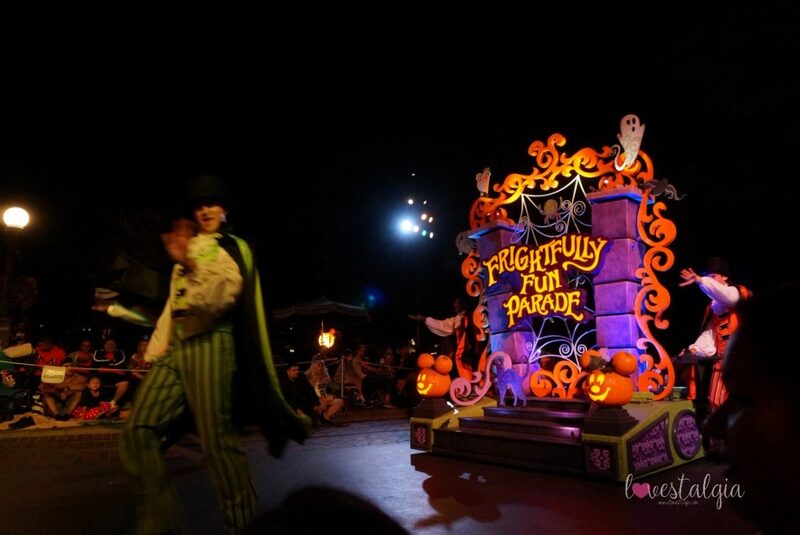 The Frightfully Fun Parade was probably my FAVORITE part of the Halloween Party! Why? Because you get to see all the villains and other character that you don’t get to see on a regular basis. I will admit that the parade seemed a bit on the shorter side compared to other parades but it was still enjoyable. The Headless Horseman rode again and it was so fun! The Halloween Screams Fireworks is absolutely amazing! It really puts you in the Halloween spirit! Tip: We watched the first showing of the parade then immediately moved towards the castle to wait for the fireworks. The fireworks don’t happen for another 10-15 minutes after the parade. I would recommend going further down Main Street so you can see the whole castle during the fireworks. We were right in front but there were a lot of people around us so I had to hold A the whole time so she could see. This isn’t to make myself sound like a creeper but I loved watching people during the party! What I mean by that is just seeing how much time they took to get into character or the attention to detail they took with their costumes. 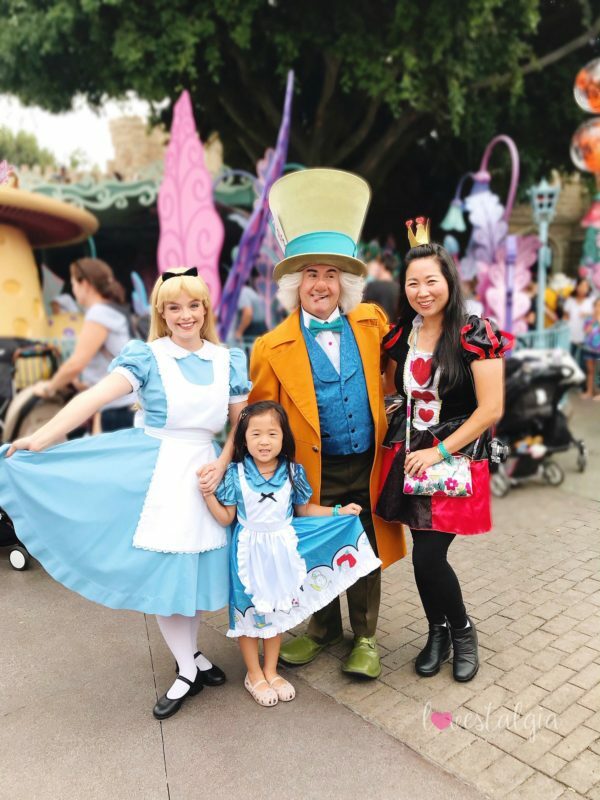 When we go to Disneyland on any given day, we see Disney bounders and amazing people like Little Gray Thread who makes her kids’ costumes. BUT seeing families in themed costumes and the creativity behind it all in one place blows my mind. During the party, there are so many activities and special performances! The Cadaver Dans sing along the foggy Rivers of America. There’s a Pixar Pals Dance Party at the Tomorrowland Terrace which A LOVED! Main Street has some amazing projections on the buildings which shrouds the street with a Disney spooky ambience that’s SOOO different than a regular day. And there’s plenty of character meet and greets- more than you can probably do in one night. There’s so much to see and do! As you know, A is 5 years old. We’ve been passholders since she was 1.5 years old. I’m not sure if I would have taken her to the Halloween party those other years because she gets spooked easily. As she’s gotten older, she’s watched a lot of Disney movies and we read Disney books often so she is familiar with the characters. She’s not really scared of the villains anymore. Plus there’s something magical about the 5 year old because their face lights up when they enjoy something. 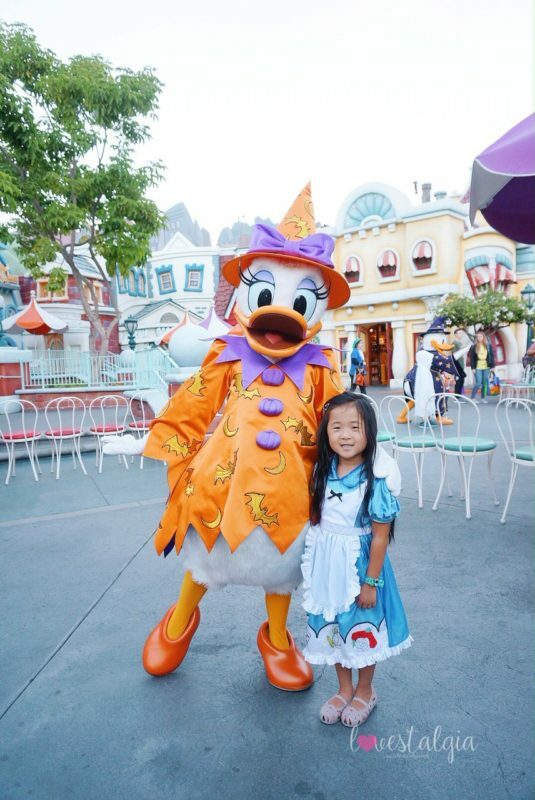 Taking her to Mickey’s Halloween Party this year was perfect because she REALLY enjoyed herself. 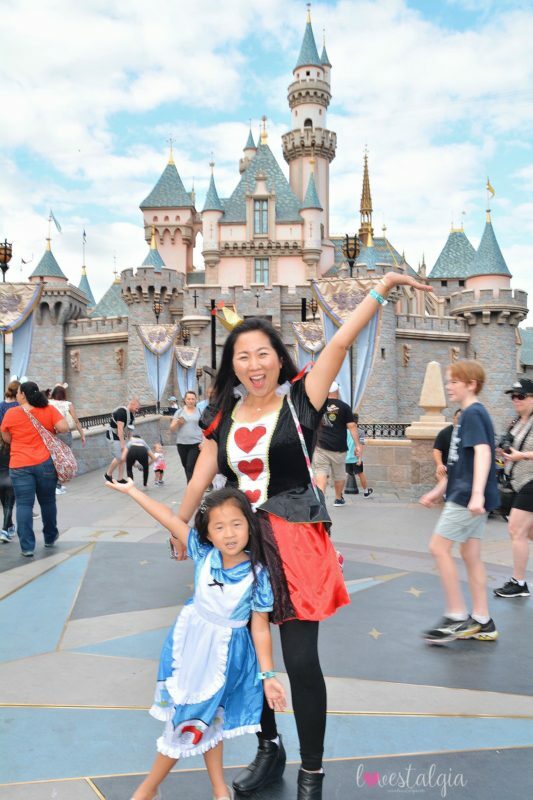 She had more stamina, she wasn’t a tantrum machine, she can communicate, and she still believes in the magic of Disney. Creating these memories with her was priceless. If you’re there earlier on a party day, you can get your party wristbands at the Starcade in Tomorrowland. 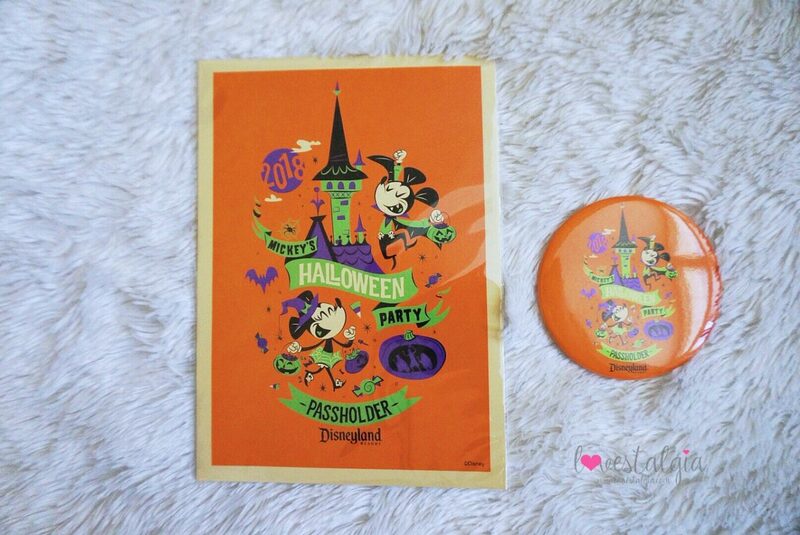 You can pick up a special AP button and post card. There’s also a treat trail and special merchandise you can buy. It really helps if you go to the party with either another parent or another family. The reason I’m saying this is because then you can “divide and conquer.” Since I just went with A, we ended up waiting around at times. 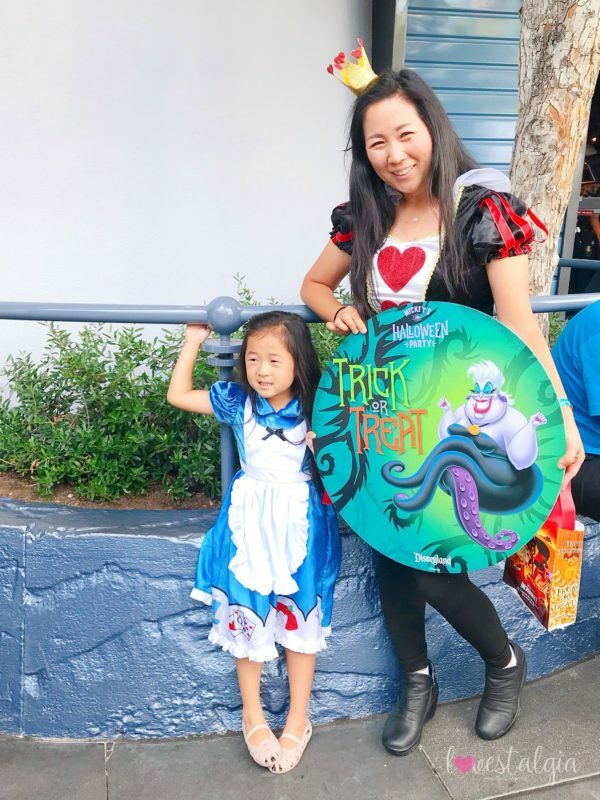 She didn’t mind but if we went as a family, one parent could have taken her to get more candy or go take pictures with characters while the other waited for the parade or other characters. It’s also helpful to have someone else with you so they can be your photographer! BRING AN EXTRA BAG or TWO if you plan on getting candy. They do give you a small bag when you check in to get your wristband. But it’s really not big enough for all the treats you’ll get. They do have “healthier” options and non candy treats which is pictured below. Check out Toontown if you have little ones. It opens up one hour before the party time for trick or treating. We started waiting a half hour before it opened and the line was long! 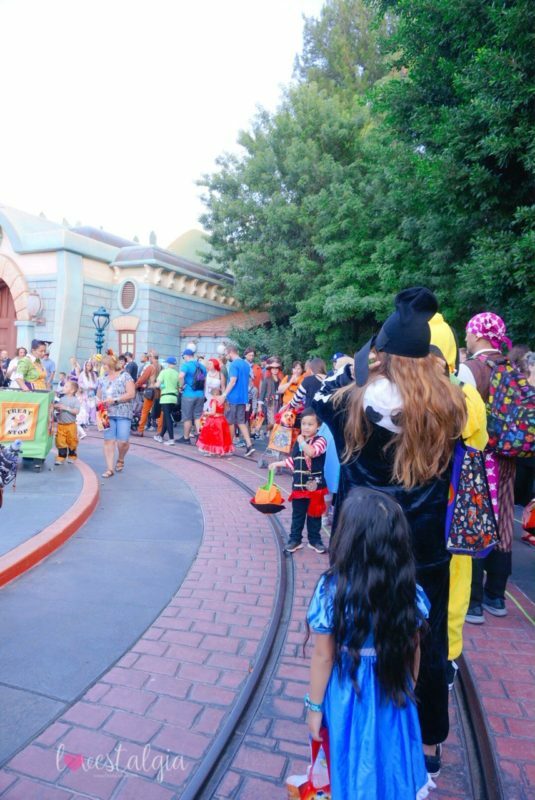 You can see Mickey, Minnie, Donald, Daisy, Goofy and a few other characters dressed in different Halloween costumes than during the day. The lines for characters are long so if that’s your priority, do it first. The candy lines can get long but most of the time, it goes by quickly. I wish we went to take a picture with the characters in Toontown before we started the treat trails there. That took up quite a bit of time while the candy lines went buy rather quickly. People say that the candy lines are shorter at the end of the evening and that cast members are more generous with their candy distribution but I wouldn’t know because A wanted to go to all the candy lines! Like I said, she was there for the candy! Keep track of the time. I thought that the party ended later so we didn’t get to go visit Villain Square because we were too busy getting candy! HAVE A PLAN. Like any trip to Disneyland, you need a plan. Because I’m an AP I didn’t really have a plan. 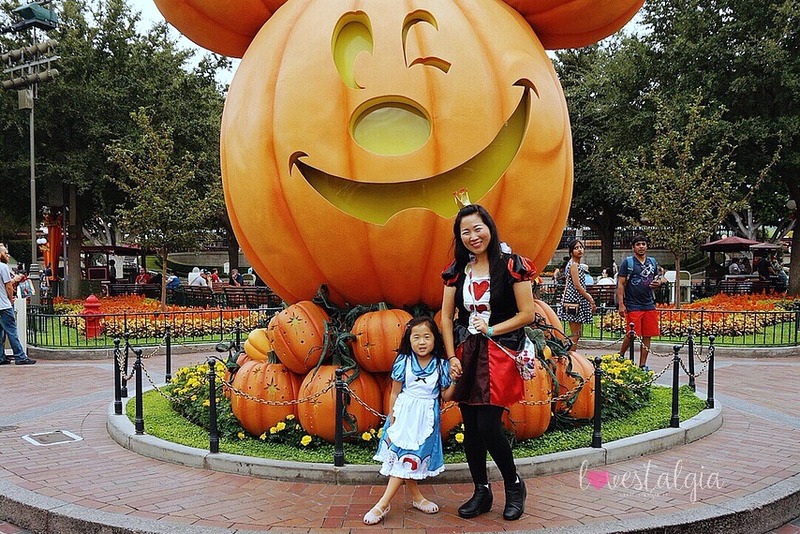 But there are so many amazing bloggers who have covered Mickey’s Halloween Party with great tips! Bottom Line: Would I go again? If I can afford it, YES! If you’re a fan of Disney, it’s definitely an event that shouldn’t be missed. Yes, it’s a bit pricey BUT you know what you’ll be getting- the same Disney magic, story telling, and safety you expect from any Disney experience! Will you be attending Mickey’s Halloween Party next year? See you there! Check out my post about Things to Do with Kids on Pixar Pier here.